Downtown 12th Man in lights and CenturyLink Field illuminated on the right. Photo by Sarah Minaker. For visitors and locals alike, it is nearly impossible to step foot in Seattle without taking notice of the Seahawk’s fervent 12th man following. ESPN’s Chris Berman even questioned whether Seattle had seceded from the Union, referring to the replacement of American Flags with the 12th Man version. These days, life in the city is best illustrated in “12s.” Our breathtaking skyline is enhanced by a giant luminous “12” made possible by strategic office window lighting. On select days, Starbucks Coffee is 12 cents. 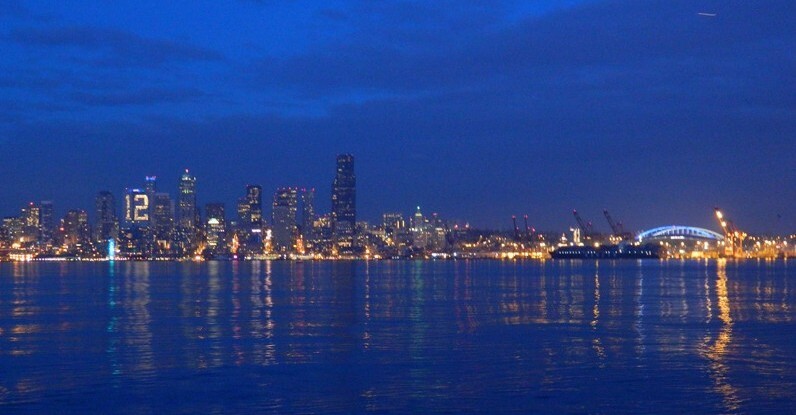 The Space Needle is crowned with a Seahawk Blue “12” flag, saluted by 12th men from every direction. Entering the heart of the city via SR 99 North, there’s no mistaking the larger-than-life “12” plastered on the side of a yet-to-be-finished apartment building which overlooks the neon blue-lit arches of the 12th Man’s home base, Century Link Field. This fandom encapsulates the beauty of Seattle sports and the unity that the love of the game creates for Seattle’s 650,000 residents. The 79th Annual Seattle Sports Star of the Year Awards at Benaroya Hall. Photo by Jon Beck. On January 22, the Seattle Sports Commission celebrated this bond at downtown’s regal Benaroya Hall for the 79th Annual MTR Western Sports Star of the Year awards show. For one night each year, athletes, facilitators and supporters of Seattle athletics come to enjoy an evening of red carpet walking, photo-taking, athlete shoulder-rubbing and award-receiving entertainment. From humble beginnings in 1936, legendary Seattle Post-Intelligencer Sports Editor Royal Brougham began this tradition from his natural curiosity to determine who the past year’s top local athlete was. This curiosity evolved from his column, “The Morning After,” into a banquet attended by the who’s-who of local sports, in which form it remained for 74 years. 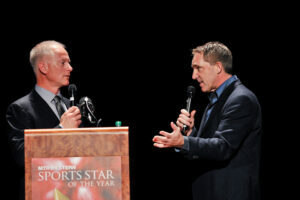 The 75th Annual Sports Star of the Year was the first show hosted by the Seattle Sports Commission and the first presented in a theater format award show. 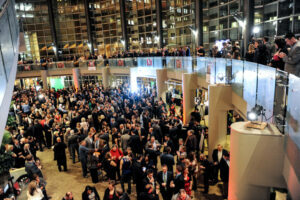 Add in the glam of a media-packed red carpet, sprinkle in the names you know from this generation of Washington State sports and you have what’s gained the reputation as the Northwest’s Premier Celebration of Washington Sports. Host Kenny Mayne and former Seahawk QB David Krieg. Photo by Jon-Beck. This year’s installment was hosted by Kent’s own Kenny Mayne, of ESPN fame, who kept the audience laughing with his wit and dry sense of humor. Those who graced the stage as presenters include UW product and current NBAer Quincy Pondexter, three-time Tour de France champion Greg LeMond, former UW All-American and NFLer Greg Lewis, as well as the first American to summit Mount Everest, Jim Whittaker, among others. Notable attendees ranged from local politicians, key management and star athletes from Seattle’s pro franchises and major universities, and even 18 Little Leaguers dressed to the tee in full-suits (a first for many of them). 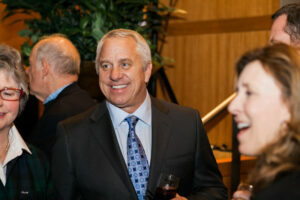 Three-time Tour De France Champion Greg LeMond. Photo by Phototainment. As the curtains fell, the room was filled with a great sense of pride and accomplishment. The crowd filed out, still buzzing from 2013 Male Sports Star of the Year, Russell Wilson, and his words to the audience: “We still have a lot more to do, we still have one game left.” He spoke via prerecorded acceptance video. 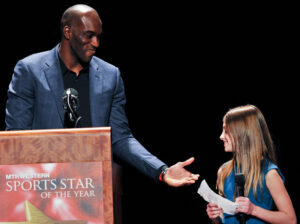 Former UW Basketball Star and current NBAer Quincy Pondexter with Presenter Lauren Slavin. Photo by Jon Beck. Ah yes, there is still a game to be played before the 2013 season is truly “complete.” As attendees spilled onto Seattle’s nighttime streets, the glow of “Go Hawks,” “I’m in,” and, of course, the legendary “12” captured everyone’s gaze and gave reminder that behold, the Super Bowl is still upon us! UW Running Back Bishop Sankey and Eastlake Little League. Photo by Phototainment. Eastlake from Sammamish staged a dramatic run for the Little League World Series title, gaining a national audience along the way. Coach Rob Chandler’s team rallied repeatedly to avoid elimination set a record for consecutive hits and finished third in the nation. Junior outside hitter Krista Vansant was Pac-12 Player of the Year, AVCA National Player of the Year and Honda Award Winner after leading the Huskies to the conference championship. She was at her best in the NCAA tournament, showing All-American skills as she boosted UW into the Final Four at KeyArena. Quarterback Russell Wilson set an NFL record for most wins in his first two seasons, maintained one of the league’s top passer ratings and led the Seahawks to the NFC’s best win-loss record. He was a strong contender for MVP honors. 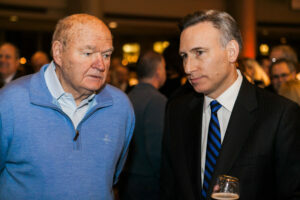 Ski Filmmaking Pioneer Warren Miller & King County Executive Dow Constantine. Photo by Phototainment. Warren Miller’s name is synonymous with spectacular skiing and snowboarding movies. As founder of Warren Miller Entertainment, his credits include books, articles and more than 750 films – crowd pleasers full of jaw-dropping feats and gorgeous scenery. Zack Lystedt suffered a catastrophic brain injury in 2006 due to multiple concussions as a football player at Tahoma High School. His case led Washington State to pass the Lystedt Law in 2009 to protect athletes who are suspected of having a concussion. Versions of that law are now in effect in 49 states. Bobo Brayton went from being Washington State’s first baseball All-American as a shortstop in 1947 to becoming its all-time winningest coach. From 1962 to 1994 his teams won 1,162 games, 21 conference titles and twice reached the College World Series. Editor’s Note: Thanks to additional copy writing by Glenn Drosendahl.